For the British company, see East India Company. For other uses, see East India (disambiguation). Not to be confused with East Indies. East India is a region of India consisting of the Indian states of Bihar, Jharkhand, West Bengal, Odisha and also the union territory Andaman and Nicobar Islands. West Bengal's capital Kolkata is the largest city of this region. The Kolkata Metropolitan Area is the country's third largest. The states of Bihar and West Bengal lie on the Indo-Gangetic plain. Jharkhand is situated on the Chota Nagpur Plateau. Odisha lies on the Eastern Ghats and the Deccan Plateau. The region is bounded by the Nepal and Sikkim Himalayas in the north, the states of Uttar Pradesh and Chhattisgarh on the west, the state of Andhra Pradesh in the south and the Bay of Bengal on the east. It is connected to the Seven Sister States of Northeast India by the narrow Siliguri Corridor in the north east of West Bengal. The extent of the Maurya Empire. The extent of the Gupta Empire. The region was the historical centre of the Nanda, Maurya, Shunga, Gupta and Pala empires that ruled much of the Indian sub-continent at their prime. In medieval India, it was incorporated into the Mughal, Maratha and then the British empire. After independence in 1947, the states joined the Indian Union and took their current form after the States Reorganisation Act of 1956. Today, they continue to face problems of overpopulation, environmental degradation and pervasive corruption despite significant economic and social progress. After the Kalinga War the Maurya king Ashoka sent emissaries to spread Buddhism across Asia. The famous university of Nalanda was in Bihar. Chinese travellers visited Buddhist and Hindu temples and libraries in the universities of Magadha Empire. The Emperor of Kalinga Mahameghavahana Aira Kharavela was one of the most powerful monarchs of ancient India. The Jain thirkhankar Mahaveer was born here and founded Jainism. Islamic invasions in the 13th century resulted in the collapse of Hindu kings and most Buddhists, especially in East Bengal, converted to Islam. East India including Bihar and West Bengal was part of the Mughal Empire in the 16th and 17th centuries. Odisha remained a powerful Hindu dynasty under the rule of Soma/Keshari Dynasty, Eastern Ganga Dynasty, Surya Dynasty till the end of the 16th century. The mighty Nalanda University existed at Nalanda which was destroyed by Bakhtiar Khilji during the 12th century and also defeated Sena Dynasty. Sher Shah Suri, who became king of India after defeating Humayun, founded the city of Patna on the ruins of ancient Pataliputra. With the arrival of the Europeans in the 17th century, outposts were established in Odisha Coast and Bengal. The European traders established their trade centres in the famous ports of Balasore, Pipili, Palur in the Odisha Coast during the rule of the last independent Hindu king Gajapati Prataprudra Dev. The Portuguese were in Chittagong, Dutch in Chinsura, French in Pondicherry and the English founded Calcutta. In 1756, the British East India Company defeated the local Indian Muslim rulers in Plassey and established British Rule in the subcontinent. Its capital Calcutta grew into one of the world's greatest ports. Tea from Calcutta was off-loaded by American separatists in the American War of Independence in the 1770s. In the 19th century, Calcutta's traders and merchants traded with the rest of the British Empire, continental Europe, the United States and China. Indentured Indian labourers from Bihar, sailed to new homes in Fiji, Mauritius, Guyana, Surinam and South Africa. India's independence movement had strong roots in East India. The feudal land system, established through the Permanent Settlement of Bengal, was unpopular among the peasant cultivators and the numerous agricultural labourers found all over Bihar and Bengal (Khetmazdoors). The Indian Rebellion of 1857 started in Bengal. British war propaganda asserted there were atrocities by the mutinous soldiers in the Black Hole of Calcutta. Eventually the British prevailed, and Calcutta remained capital of Britain's Asian dominions until 1911. During Gandhi's independence movement, the Bihari village of Champaran was an important supporter of non-violent resistance. Great poets of the stature of Rabindranath Tagore championed the movement for self-rule. The Partition also had its roots in undivided Eastern India. The Muslim League was founded in Dhaka in 1906. In the 1937 provincial elections, it came to power in Bengal in alliance with the Krishak Praja Party. in 1944, it gained an absolute majority in the Bengal Assembly, and Hussein Suhrawardy became the Chief Minister. After widespread communal violence during the Direct Action Day protests in Calcutta, leading to further communal violence across British India, the creation of Pakistan became inevitable. In 1947, further communal violence displaced millions as independence and partition of British India occurred. Some Bihari and Bengali Muslims fled to the newly created East Pakistan. Most East Bengal Hindus fled to India. The 1950s saw industrial progress in East India. These were cut short with the conflict in neighbouring East Pakistan and by the Communist movement at home. In 1971, in the course of Bangladesh's independence struggle, millions of refugees poured into East India. From the turn of the 21st century, West Bengal's economic growth has been rapid, and it now ranks as the fourth largest GDP contributor after Maharashtra, according to the List of Indian states by GDP and is now one of the fastest-growing economies among the states of India. Bihar and Odisha struggled with economic issues during the British rule and in the beginning of post independent India. But in recent years, these two states have shown impressive growth record and developed steadily. The economic boom since 2005 started to spread new malls, highways, airports and IT office complexes, but not evenly across the region. Jharkhand became a separate state on 15 November 2000. In the modern times, these states have seen rapid transformation and home to several mineral and metal based industries, coal based thermal powers units, oil refineries, ports, textile industries and well established public and private educational institutes. Bihar, Odisha and Jharkhand rank 14th, 16th and 18th in the List of Indian states by GDP. Odisha has shown consistent growth in the state GDP and received the recognition of the fastest-growing economy among the states in India. Nalanda, Puspagiri and Vikramshila universities were the famed institutions of higher learning in ancient India located in Eastern India. One of the first great universities in recorded history was the ancient Nalanda University located in Bihar and another institute of higher learning was the ancient Puspagiri University recently discovered in Odisha. Education in the eastern part of India has seen rapid transformation. Several new educational institutes have been established to cater the needs of students. East India is now the home to some of the great Indian universities and Institutions of National Importance. Some prominent institutions of higher learning located in the states of eastern India are listed below. There were many ancient cities established in eastern India. Prominent among them were Pataliputra, Bangarh, Tamralipta, Champapuri, Chandraketugarh, Dantapura, Gauda, Sisupalgarh, Tosali, Gaya, Jaugada, Pandua, Rajapura, Asurgarh and Vaishali. West Bengal's capital Kolkata, the capital of British India until 1911, is the biggest metropolis and economically dominant city of the region and third largest in India and one of the fastest-growing cities in the world. It is also the main centre of commerce or the commercial capital of Eastern and north eastern India. Kolkata is very fast transforming itself to become city equipped with every facilities for IT and ITES and also financial outsourcing hub and its satellites Salt Lake City, Kolkata and Rajarhat are taken the burdens of India's IT and financial boom. There are many Satellite town also situated in Kolkata, some of them are Salt Lake City, Kolkata, Rajarhat, Kolkata West International City, Kalyani, West Bengal, Calcutta Riverside. It is also known as city of joy. However, the mid-sized cities of Asansol, Durgapur, Siliguri in West Bengal are rapidly growing urban areas.West Bengal is the highest contributor of GDP among all other eastern state for India and it is also one of the Fastest-growing states in India. West Bengal is the hub of industry and economic activisties in Eastern India and it is also the home to the tallest skylines located in this region and are also among one of the tallest buildings in the country. It is also the home of history of rising India. The Kolkata metropolitan area is spread over 1,886.67 km2 (728.45 sq mi):7 and comprises 3 municipal corporations (including Kolkata Municipal Corporation), 39 local municipalities and 24 panchayat samitis, as of 2011[update]. :7 The urban agglomeration encompassed 72 cities and 527 towns and villages, as of 2006[update]. Suburban areas in the Kolkata metropolitan area incorporate parts of the following districts: North 24 Parganas, South 24 Parganas, Howrah, Hooghly, and Nadia. :15 Kolkata, which is under the jurisdiction of the Kolkata Municipal Corporation ( KMC), has an area of 185 km2 (71 sq mi). The east–west dimension of the city is comparatively narrow, stretching from the Hooghly River in the west to roughly the Eastern Metropolitan Bypass in the east—a span of 9–10 km (5.6–6.2 mi). The north–south distance is greater, and its axis is used to section the city into North, Central, and South Kolkata. North Kolkata is the oldest part of the city. Characterised by 19th-century architecture and narrow alleyways, it includes areas such as Shyambazar, Shobhabazar, Chitpur, Cossipore, Sinthee, and Dum Dum. :65–66 The north sub urban areas like Baranagar, Belghoria, Sodepur, Khardah up to Barrackpur are also within the city of Kolkata (as a metropolitan structure). Central Kolkata hosts the central business district. It contains B. B. D. Bagh, formerly known as Dalhousie Square, and the Esplanade on its east; Strand Road is on its west. The West Bengal Secretariat, General Post Office, Reserve Bank of India, High Court, Lalbazar Police Headquarters, and several other government and private offices are located there. Another business hub is the area south of Park Street, which comprises thoroughfares such as Jawaharlal Nehru Road, Camac Street, Wood Street, Loudon Street, Shakespeare Sarani, and A. J. C. Bose Road. The Maidan is a large open field in the heart of the city that has been called the "lungs of Kolkata" and accommodates sporting events and public meetings. The Victoria Memorial and Kolkata Race Course are located at the southern end of the Maidan. Among the other parks are Central Park in Bidhannagar and Millennium Park on Strand Road, along the Hooghly River. Asansol is the district headquarters of Paschim Bardhaman District in West Bengal. It is the second largest city in West Bengal after Kolkata and the 39th largest urban agglomeration in India. According to a 2010 report prepared by the International Institute for Environment and Development, a UK-based policy research non-governmental think tank, Asansol is ranked 11th among Indian cities. and 42nd in the world in its list of 100 fastest-growing cities. As per the recommendations of the Sixth Central Pay Commission, Asansol has been listed as a Y-category city for calculation of HRA (House Rent Allowance) for public servants. It is one of the three non-Z category cities in West Bengal apart from Kolkata, which belong to the X category making it a tier-II city. Durgapur is by far the most industrialised city in eastern India and the second planned city in India. It started with the first prime minister of independent India, Jawaharlal Nehru. His dream of transforming the backward agricultural country into an industrially advanced nation was picked up in West Bengal by Dr. B.C. Roy. At the earlier stages for the selection of a proper site for a new industrial township, Jnananjan Niyogi, a great business organiser and planner, was involved. Modernist American architect Joseph Allen Stein, invited to head the newly formed Department of Architecture and Planning at the Bengal Engineering College in Calcutta, plunged into a major project as soon as he reached India in 1952 – the designing of Durgapur city with Benjamin Polk, another American architect already living in Calcutta. Thereafter it was the task of local leaders such as Ananda Gopal Mukherjee and bureaucrats such as K.K. Sen to get Durgapur going. Bihar has Patna, Bhagalpur, Darbhanga, Muzaffarpur, Gaya and Purnia as important urban areas. In Jharkhand the major urban areas are mainly dominated by industrial cities such as Ranchi, Bokaro Steel City, Deoghar Jamshedpur, Hazaribagh and Dhanbad. Patna is the capital of the Bihar, its most populous city and the second most populous city in Eastern India. It is the administrative, industrial and educational centre of the state. Patna is one of the oldest continuously inhabited places in the world. Ancient Patna, known as Pataliputra, was the capital of the Magadha Empire under the Haryanka, Nanda, Mauryan, Shunga, Gupta and Pala. The modern city of Patna is situated on the southern bank of the Ganges. The city also straddles the rivers Sone, Gandak and Punpun. The city is approximately 35 km long and 16 km to 18 km wide. It is the second largest city of Eastern India. In June 2009, the World Bank ranked Patna second in India (after Delhi) for ease of starting a business. As of 2004-2005, Patna had the highest per capita gross district domestic product in Bihar, at ₹63,063. Using fi gures for assumed average annual growth, Patna is the 21st fastest-growing city in the world and 5th fastest-growing city in India by the City Mayors' Foundation. Patna registered an average annual growth of 3.72% during 2006-2010. The city is also home to many tutorials and coaching institutes who prepare students for various entrance exams.IIT NIT NIFT AIIMS and other leading educational institutions are running successfully in Patna. City is also developing excellent road infrastructure to boom its economy. Ganga expressway and elevated corridors are under some of the ongoing projects in the city. A world class museum is also on its way to completion. The old museum of the city will be replaced by one of the biggest mall in east India. Patna Metro rail corporations is also going to start soon by 2021.It would be the second metro railway in eastern India after Kolkata and the third in North India after Delhi and Lucknow. IT parks are also developing in and around the city. Patna recorded a per capita of Rs 63,063. The per capita level for 2007 was higher than Bangalore or Hyderabad, which are both leading centres for global software development. Bhubaneswar is the capital of the Odisha. Other Important Cities are Cuttack, Brahmapur, Rourkela, Sambalpur and Puri.The Capital city has a long history of over 2000 years starting with Chedi dynasty (around the 2nd century BCE) who had Sisupalgarh near present-day Bhubaneswar as their capital. Historically, Bhubaneswar has been known by different names such as Toshali, Kalinga Nagari, Nagar Kalinga, Ekamra Kanan, Ekamra Kshetra and Mandira Malini Nagari (city of temples) or the temple city of India. The largest city of Odisha, Bhubaneswar today is a center of economic and religious importance in the region. With the economic liberalisation policy adopted by the Government of India in the '90s, Bhubaneswar received large investments in the fields of telecommunications, IT and higher education, particularly in science and engineering. The city is home to around 60 engineering colleges (as of 2009) and the number is growing every year. The city is also home to many tutorials and coaching institutes who prepare students for various entrance exams. Retail and Real Estate have also emerged as big players. Recent times have seen large scale retail chains such as Reliance, Vishal MegaMart, Big Bazaar, Pantaloon, Pal Heights, Indulge, New Leaf, Habib's, had opened outlets in Bhubaneswar. Large corporations like DLF Universal and Reliance Industries have entered the real estate market in the city. DLF Limited is developing an Infopark spread over an area of 54 acres (220,000 m2) in the city. Expanding its business portfolio, the Kolkata-based Saraf Group, promoters of Forum Mart shopping malls is constructing another Shopping mall named Forum Lifestyle mall a 550,000 sq ft (51,000 m2) lifestyle mall in Bhubaneswar with 1,200 car parks. The rich minerals resources of Odisha have been the backbone of the economy dominated by Government. Steel Authority of India Limited (SAIL) and private organisations like Jindal, Vedanta and TATAS. Despite this rapid growth, an ample number of the populace live in slums. Migration from rural areas, especially from the northern districts of Andhra Pradesh, has led to the growth of slums which are a major challenge to the city's growth. The Government has fostered growth in this sphere by the development of IT Parks such as Infocity 1 and the new Infocity 2. The Info City was conceived as a five star park, under the Export Promotion Industrial Parks (EPIP) Scheme to create high quality infrastructure facilities for setting up Information Technology related industries. Infosys and Satyam Computer Services Ltd. have been present in Bhubaneswar since 1996-97. Its current head count stands at around 5000. The first part of the TCS centre is ready and has a capacity to accommodate nearly 1,200 professionals but the software major has only 250 employees at present. The Finland telecommunication company, Nethawk, has its India R&D center at Bhubaneswar. The Canadian giant, Gennum Corporation has its India development centre at Bhubaneswar. The famous auditors Price water house Coopers Pvt. Ltd. also has a center in Bhubaneswar. The private STP is located at Infocity in Chandaka, Bhubaneswar with a view to provide incubation and infrastructure facilities to new and young entrepreneurs in the MSME sector, The intelligent building of the JSS STP is spread in a sprawling 3-acre (12,000 m2) campus and houses state-of-art technology to fulfil the growing demands of highly competent IT professionals. The Eastern India particularly Odisha and Jharkhand have rich mineral resources which resulted in Economic boom in these two states. Several mineral based industries have been established in many cities of Odisha and Jharkhand namely Kalinganagar, Angul, Paradeep, Talcher, Rourkela, Damanjodi, Joda, Barbil, Choudwar, Jharsuguda Jamshedpur, Bokaro, Dhanbad and Ranchi. Bengali is the dominant language of West Bengal. Hindi along with Urdu, Maithili, Magahi and Bhojpuri are the dominant language of Bihar. Hindi, Santali, Khortha and Nagpuri are the dominant language of Jharkhand; however, some tribals speak their own tribal languages. Jharkhand has accorded second language status to Angika, Bengali, Bhojpuri, Ho, Kharia, Kurukh, Khortha, Kurmali, Magahi, Maithili, Mundari, Nagpuri, Odia, Santali and Urdu.Odia is the dominant language of Odisha. Odia is the only major classical language in east India and sixth Indian language to be considered as a classical language in the basis of being old and not borrowed from other languages. According to Indian National Mission for Manuscripts, after Sanskrit, Odia has the second-highest number of manuscripts. As per records there are around 2.13 lakhs ancient manuscript in Odia. In the list Bengali is in 9th position with 15412 ancient manuscripts. The Indo-Aryan languages spoken in this region descend from the Magadhi Prakrit, which was spoken in the ancient kingdom of Magadha. Odia emerged as a distinct language from Odra Magadhi Prakrit and Maithili emerged around the 9th century CE. Many of the minority Tribal languages of East India belong to the Munda branch of the Austroasiatic language family and Dravidian language family. Major representatives of Autro-asiatic language include the Mundari, Santali and Ho. Dravidian languages include Kurukh, Kui and Pengo. National Highway 31A winds along the banks of the Teesta River near Kalimpong, in the Darjeeling Himalayan hill region in West Bengal. The region lies in the humid-subtropical zone, and experiences hot summers from March to June, the monsoon from July to October and mild winters from November to February. The interior states have a drier climate and slightly more extreme climate, especially during the winters and summers, but the whole region receives heavy, sustained rainfall during the monsoon months. Snowfall occurs in the extreme northern regions of West Bengal. Swami Vivekananda was a key figure in introducing Vedanta and Yoga in Europe and USA, raising interfaith awareness and making Hinduism a world religion. Durga, Jagannath, Shiva and Rama are particularly popular Hindu deities in this region. Durga & Kali are patron deities of Bengal and Mithila whereas Jagannath or Vishnu is patron god among Odia people. Rama and Hanuman are most revered in Bihar. Shiva is popular in all areas of eastern states. Among tribals of the region Hinduism is the dominant religion. Some tribals also follow their indigenous religions (Sarana). There are several places of pilgrimage for Hinduism. Puri in Odisha is one of the four holy City/Dham of Hindu religion and particularly known for Rath Yatra festival. Bhubaneswar is considered to be the "City of Temples".Konark houses an old sun temple. Bihar Sharif is an important pilgrimage centre for Muslims all over Bihar. In Bihar Village Harinagar Bajrang Bali temple is very famous for Hindu people. Dakshineswar Kali Temple is a famous historical Kali temple in West Bengal. Kalighat Kali temple in Kolkata is the most important of all Shakti Peethas in India. Belur Math in Kolkata is the headquarters of the Ramkrishna Mission founded by Swami Vivekananda. In Bihar, Gaya is known for temple for salvation of ancestors. Other places are Sultanganj in Bhagalpur and Vaidyanath Jyotirlinga in Deoghar, Jharkhand. Bodh Gaya is the city sacred to Buddhism. There are also other cities sacred to Jains in Bihar and Jharkhand. Bengali cuisine is a culinary style originating in Bengal which is now divided between the Indian state of West Bengal and today's Bangladesh. Other regions, such as Tripura, and the Barak Valley region of Assam (in India) including some parts of Odisha, Jharkhand and Bihar also have large native Bengali populations and share this cuisine. With an emphasis on fish, vegetables and lentils served with rice as a staple diet, Bengali cuisine is known for its subtle (yet sometimes fiery) flavours, and its huge spread of confectioneries and desserts. It also has the only traditionally developed multi-course tradition from the Indian subcontinent that is analogous in structure to the modern service à la russe style of French cuisine, with food served course-wise rather than all at once. Bengali food has inherited a large number of influences, both foreign and pan-Indian, arising from a historical and strong trade links with many parts of the world. Bengal fell under the sway of various Turkic rulers from the early thirteenth century onwards, and was then governed by the British for two centuries (1757–1947). Odia cuisine refers to the cooking of the eastern Indian state of Odisha. Foods from this area are rich and varied, while relying heavily on local ingredients. The flavours are usually subtle and delicately spiced, quite unlike the fiery curries typically associated with Indian cuisine. Fish and other seafood such as crab and shrimp are very popular. Chicken and mutton are also consumed, but somewhat occasionally. Only 6% of the population of Odisha is vegetarian, and this is reflected in its cuisine. The oil base used is mostly mustard oil, but in festivals ghee is used. Panch phutana, a mix of cumin, mustard, fennel, fenugreek and kalonji (nigella) is widely used for tempering vegetables and dals, while garam masala (curry powder) and haladi (turmeric) are commonly used for non-vegetarian curries. Pakhala, a dish made of rice, water, and yogurt, that is fermented overnight, is very popular in summer, particularly in the rural areas. Oriyas are very fond of sweets and no Oriya repast is considered complete without some dessert at the end. Festivals and fasts witness a cuisine without onion and garlic, whereas other days witness an aroma of garlic and onion paste in curries. One can find restaurants serving food without onion and garlic in major places like Puri and other coastal area, which is run by Brahmin owners. Odisha has a culinary tradition spanning centuries if not millennia. The kitchen of the famous Jagannath temple in Puri is reputed to be the largest in the world, with a thousand cooks, working around 752 wood-burning clay hearths called chulas, to feed over 10,000 people everyday. Mohiniyattam, a classical dance originating from Kerala, is being performed to commemorate of 150th birth anniversary of Tagore. It was an Indo-Bangladesh joint celebration in 2012 in Kolkata. Odissi (Odissi) is a classical dance in eastern India. It originates from the state of Odisha, in eastern India. It is the oldest surviving dance form of India on the basis of archaeological evidences. Odissi has a long, unbroken tradition of 2,000 years and finds mention in the Natyashastra of Bharatamuni, possibly written circa 200 BCE. Mahari Dance is one of the important dance forms of Odisha and originated in the temples of Odisha. History of Odisha provides evidence of the 'Devadasi' cult in Odisha. Devadasis were dancing girls who were dedicated to the temples of Odisha. The Devadasis in Odisha were known as 'Maharis' and the dance performed by them came to be known as Mahari Dance. Gotipua dance is another form of dance in Odisha. In Oriya colloquial language Gotipua means single boy. The dance performance done by a single boy is known as Gotipua dance. There are many folk dances in east India, with the best-known being Jhijhiya, Jhumair, Domkach, Ghumura Dance, Sambalpuri and Chhau dance. Jhijhiya is a cultural dance from the Mithila region. Jhijhiya is mostly performed at time of Dusshera, in dedication to Durga Bhairavi, the goddess of victory. While performing jhijhiya, women put lanterns made of clay on their head and they balance it while they dance. Jhumair is a folk dance in Chota Nagpur Plateau region of Jharkhand, Chhattisgarh, Odisha and West Bengal. It is performed during harvest season and festivals accompanied by musical instrument such as Madal, Dhol, Bansuri, Nagara, Dhak and Shehnai. Domkach is folk dance in the state of Bihar, Jharkhand, Chhattisgarh and Odisha. It performed during marriage in the house of Bride and groom. Chhau dance (or Chau dance) is a form of tribal martial dance originating in Mayurbhanj, the princely state of Odisha. It is also seen in the Indian states of West Bengal, Jharkhand and Odisha. There are three regional variations of the dance. Seraikella Chau was developed in Seraikella, the administrative head of the Seraikela Kharsawan district of Jharkhand; Purulia Chau in Purulia district of West Bengal; and Mayurbhanj Chau in Mayurbhanj district of Odisha. Ghumura Dance Archaeological evidence shows cave paintings from the pre-historic period discovered by Gudahandi of Kalahandi and Yogi Matha of Nuapada district that represent the Ghumura and Damru, among other instruments. These paintings date to as early as 8000 BCE and from such painting the antiquity of musical instrument Ghumura and Damru can be imagined. The origin of Ghumura goes back to ancient times. There is a beautiful waterfall in the river valley of Indravati which was initially recognised by Chindak Naagas of Chakrakot. Many believe that Ghumura dance originated from this river valley and gradually spread into the areas between Indravati and Mahanadi, indicating this dance form belongs to the 10th century CE. The western Odisha has also great variety of dance forms unique to Odisha culture. The children's verses are known as "Chhiollai", "Humobauli" and "Dauligit". The adolescent poems are "Sajani", "Chhata", "Daika", "Bhekani". The eternal youth composes "Rasarkeli", "Jaiphul", "Maila Jada", "Bayamana", "Gunchikuta" and "Dalkhai". The work-man's poetry comprises "Karma" and "Jhumer", both pertaining to Lord Vishwakarma and the "Karamashani" goddess. The professional entertainers perform Dand, Danggada, Mudgada, Ghumra, Sadhana, Sabar – Sabaren, Disdigo, Nachina – Bajnia, Samparda and Sanchar. They are performed on a variety of occasions and their rhymes and rhythms change accordingly. Bengali dance forms draw from folk traditions, especially those of the tribal groups, as well as from the broader Indian dance tradition. Dance forms of Bihar are another expression of rich traditions and ethnic identity. There are several folk dance forms that can keep one enthralled, such as dhobi nach, jhumarnach, manjhi, gondnach, jitiyanach, more morni, dom-domin, bhuiababa, rah baba, kathghorwa nach, jat jatin, launda nach, bamar nach, jharni, jhijhia, natua nach, bidapad nach, sohrai nach, and gond nach. Black-and-white close-up photograph of a piece of wood boldly painted in unmixed solid strokes of black and white in a stylized semblance to "ro" and "tho" from the Bengali syllabary. Rabindra Sangeet, also known as Tagore Songs, are songs written and composed by Rabindranath Tagore. They have distinctive characteristics in the music of Bengal, popular in India and Bangladesh. "Sangeet" means music, "Rabindra Sangeet" means Songs of Rabindra. Rabindra Sangeet used Indian classical music and traditional folk music as sources. 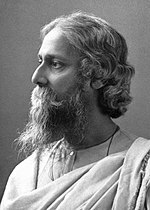 [dead link] Tagore wrote some 2,230 songs. Rabindranath Tagore was a towering figure in Indian music. Writing in Bengali, he created a library of over 2,000 songs now known by Bengalis as rabindra sangeet whose form is primarily influenced by Hindustani classical, sub-classicals, Karnatic, western, bauls, bhatiyali and different folk songs of India. Many singers in West Bengal and Bangladesh base their entire careers on the singing of Tagore musical masterpieces. The national anthem of India and national anthem of Bangladesh are Rabindra Sangeets. West Bengal's capital Kolkata is also the cultural capital of India. Panchali is a form of narrative folk songs of the Indian state of West Bengal. The word Panchali probably originates from panchal or panchalika, meaning puppet. According to another school of that, Panchali originates from the word panch, which means five in Bengali language, referring to the five elements of this genre: song, music, extempore versifying, poetic contests, and dance. Odissi music is a classical music in India originated from the eastern state of Odisha. Indian Classical music has five significant branches: Avanti, Panchali, Udramagadhi, Hindustani and carnatic. Of these, Udramagadhi exists in the form of Odissi music. Generally, Odissi is one of the classical dances of India performed with Odissi music. Odissi music got shaped during the time of famous Oriya poet, Jayadeva, who composed lyrics meant to be sung. By the 11th century CE folk music of Odisha existing in the form of Triswari, Chatuhswari, and Panchaswari was modified into the classical style. However, Odissi songs were written even before the Odia language developed. Odissi music has a rich legacy dating back to the 2nd century BCE, when king Kharvela, the ruler of Odisha (Kalinga) patronised this music and dance. Like Hindustani and Carnatic systems, Odissi music is a separate system of Indian classical music and is having all the essential as well as potential ingredients of Indian Classical form. But it has not come to limelight due to apathy from the time of British rule in Odisha, want of its proper study, revival, propagation, etc. Despite the fact, the traditional music form could be saved and maintained in its pristine form. Thanks to the musicians particularly of Jaga Akhadas of Puri district, who could develop and maintain the music. The music movement of Odisha, however, took a different turn after independence. Like other aspects of her culture, music of the sacred land (Odisha) is charming, colourful, variegated encompassing various types. The existing musical tradition of Odisha, the cumulative experience of the last two thousand five hundred years if not more, can broadly be grouped under five categories such as: (1) Tribal Music, (2) Folk Music, (3) Light Music, (4) Light-Classical Music, (5) Classical Music, which need a short elucidations for better understanding the subject in all India context. The tribal music as the title signifies is confined to the tribals living mainly in the hilly and jungle regions and sparsely in the coastal belt of Odisha. Odisha has the third largest concentration of tribes constituting about one fourth of the total population. They are distributed over 62 tribal communities. Odisha is the treasure house of Folk Songs which are sung on different festivals and specific occasions in their own enjoyment. Folk music in general is the expression of the ethos and mores of the folk communities. Of the bewildering variety of folk music of Odisha, mention may be made of Geeta, Balipuja Geeta, Kela Keluni Geeta, Dalkhai Geeta, Kendra Geeta, Jaiphula Geeta, Ghumura Geeta, Ghoda Nacha and Danda Nacha Geeta, Gopal Ugala and Osa-Parva-Geeta etc. Bhajan, Janan, Oriya songs based on ragas, Rangila Chaupadi etc. are grouped under Light classical music, which forms an important segment of Oriya music. Sri Geetagovinda, Anirjukta Pravadha, Divya Manusi Prabandha, Chautisa, Chhanda, Chaupadi (now known as Odissi), Champu, Malasri, Sariman, nVyanjani, Chaturang, Tribhang, Kuduka Geeta, Laxana and Swaramalika are the various sub-forms, which individually or collectively constitute the traditional Odissi music. These sub-forms of the traditional Odissi music, can be categorised under the classical music of Odisha. The East Zone cricket team is a first-class cricket team that represents eastern India in the Duleep Trophy and Deodhar Trophy. It is a composite team of five first-class Indian teams from eastern India competing in the Ranji Trophy, containing notably the Bengal, Jharkhand, and Odisha from East India amongst the bunch. The most popular sports in Kolkata are football and cricket. The city is a centre of football activity in India and is home to top national clubs such as Mohun Bagan A.C., Kingfisher East Bengal F.C., Prayag United S.C., and the Mohammedan Sporting Club. Calcutta Football League, which was started in 1898, is the oldest football league in Asia. Mohun Bagan A.C., one of the oldest football clubs in Asia, is the only organisation to be dubbed a "National Club of India". As in the rest of India, cricket is popular in Kolkata and is played on grounds and in streets throughout the city. Kolkata has an Indian Premier League franchise known as the Kolkata Knight Riders; the Cricket Association of Bengal, which regulates cricket in West Bengal, is also based in the city. Tournaments, especially those involving cricket, football, badminton, and carrom, are regularly organised on an inter-locality or inter-club basis. The Maidan, a vast field that serves as the city's largest park, hosts several minor football and cricket clubs and coaching institutes.Eden Gardens, which has a capacity of 90,000 as of 2011, hosted the final match of the 1987 Cricket World Cup. It is home to the Bengal cricket team and the Kolkata Knight Riders. The multi-use Salt Lake Stadium, also known as Yuva Bharati Krirangan, is the world's second-largest football facility by seating capacity as of 2010. The Calcutta Cricket and Football Club is the second-oldest cricket club in the world. Kolkata has three 18-hole golf courses. The oldest is at the Royal Calcutta Golf Club, and was the first golf club to be built outside the United Kingdom. The other two are located at the Tollygunge Club and at Fort William. The Royal Calcutta Turf Club hosts horse racing and polo matches. The Calcutta Polo Club is considered the oldest extant polo club in the world. The Calcutta South Club is a venue for national and international tennis tournaments; it held the first grass-court national championship in 1946. In the period 2005–2007, Sunfeast Open, a tier-III tournament on the Women's Tennis Association circuit, was held in the Netaji Indoor Stadium; it has since been discontinued. The Calcutta Rowing Club hosts rowing heats and training events. Kolkata, considered the leading centre of rugby union in India, gives its name to the oldest international tournament in rugby union, the Calcutta Cup. The Automobile Association of Eastern India, established in 1904, and the Bengal Motor Sports Club are involved in promoting motor sports and car rallies in Kolkata and West Bengal. The Beighton Cup, an event organised by the Bengal Hockey Association and first played in 1895, is India's oldest field hockey tournament; it is usually held on the Mohun Bagan Ground of the Maidan. Athletes from Kolkata include Sourav Ganguly and Pankaj Roy, who are former captains of the Indian national cricket team; Olympic tennis bronze medallist Leander Paes, golfer Arjun Atwal, and former footballers Sailen Manna, Chuni Goswami, P. K. Banerjee, and Subrata Bhattacharya. The Cricket Association of Bengal (CAB) is the governing body for cricket in West Bengal. Its headquarters is in the famous Eden Gardens stadium. It organises different types of cricket tournaments in West Bengal. Cricket Association of Bengal is affiliated to the Board of control for cricket in India is the parent body or governing the game of Cricket in Bengal, and involved in conducting the game of cricket in Bengal. The Cricket Association of Bengal promotes and develops Cricket by conducting various League Tournaments, tournaments for the age group Under-13, Under-16, and Under-19 and Under-21 categories. CAB also conducts National and International Tournaments. Entrance to the Barabati Stadium in Cuttack, Odisha. The most popular sports in Odisha are hockey and cricket. The Odisha Cricket Association (OCA) is the governing body of the cricket activities in the Odisha state of India and the Odisha cricket team. It is affiliated to the Board of Control for Cricket in India. The Barabati Stadium in Cuttack hosts international cricket matches. The Odisha Cricket Association promotes and develops Cricket by conducting various League Tournaments, Tournaments for the age group Under-13, Under-15, Under-17, and Under-19, Under-22 and Under-25 categories besides organising and conducting National Tournaments. The OCA started a local Twenty-20 tournament, Odisha Premier League (OPL) in the lines of Indian Premier League in 2011. OCA manages the famous Barabati Stadium and has got infrastructures and facilities like Odisha cricket academy, newly built Sachin Tendulkar Indoor cricket hall and many grounds like DRIEMS cricket stadium, Ravenshaw university ground, SCB medical ground, Nimpur ground, Basundhara (Bidanasi) ground, Sunshine Ground etc. The Odisha Premier League (OPL) was initiated by Odisha Cricket Association (OCA), Cuttack, India in line of Indian Premier League (IPL). The popularity of Hockey in Odisha is also very high. Many National players in Hockey are from Odisha. Lazarus Barla, Prabodh Tirkey, Dilip Tirkey, Ignace Tirkey, Jyoti Sunita Kullu, Subhadra Pradhan, Birendra Lakra and Anupa Barla are the few names who brought the fame to Indian hockey in International level. Premier Hockey League (PHL) was the league competition for field hockey clubs in the top divisions of the Indian hockey system. There were seven teams in the PHL and in East India the only team was the Orissa Steelers who won Premier Hockey League 2007. Odisha has a franchise in Hockey India League HIL named Kalinga Lancers owned by Odisha Industrial Infrastructure Development Corporation and MCL. Kolkata Port, Paradip Port, Dhamra Port and Haldia are 4 major ports in East India. Kulpi Port, Gopalpur Port, are minor ports in East India. ^ "State Profile". Bihar Government website. ^ Govt. of Jharkhand. "Official Site of Government of Jharkhand, India". Archived from the original on 22 April 2016. Retrieved 25 April 2016. ^ Govt of West Bengal. "Official Site of Government of West Bengal, India". Westbengal.gov.in. Archived from the original on 4 March 2000. Retrieved 15 June 2013. ^ "Odisha Tourism". www.odishatourism.gov.in. Archived from the original on 23 December 2016. Retrieved 23 December 2016. ^ "Eastern Region - Geological Survey of India". Geological Survey of India, MOI, Government of India. Archived from the original on 24 September 2015. Retrieved 2 May 2015. ^ Govt. of Odisha. "Department of Steel and Mines, Government of Odisha, India". odisha.gov.in. Archived from the original on 16 June 2016. Retrieved 26 April 2016. ^ a b "Introducing KMA" (PDF). Annual Report 2011. Kolkata Metropolitan Development Authority. 2011. Archived (PDF) from the original on 5 June 2013. Retrieved 9 February 2012. ^ Sahdev, Shashi; Verma, Nilima, eds. (2008). "Urban Land price Scenario- Kolkata − 2008" (DOC). Kolkata—an outline. Industry and Economic Planning. Town and Country Planning Organisation, Ministry of Urban Development, Government of India. ^ "BSNL may take two weeks to be back online". Times of India. New Delhi. Times News Network (TNN). 9 July 2009. Archived from the original on 1 July 2012. Retrieved 27 November 2011. With the Camac Street-Park Street-Shakespeare Sarani commercial hub located smack in the middle of the affected zone..
^ Chitta Baral (3 September 2009). "» Engineering College Clusters in Orissa in 2009". Orissalinks.com. Archived from the original on 24 August 2010. Retrieved 26 July 2010. ^ "Jharkhand gives second language status to Magahi, Angika, Bhojpuri and Maithili". The Avenue Mail. 21 March 2018. ^ "Bedlam & bill rush in Assembly". The Telegraph. 21 June 2018. ^ "Report of the Commissioner for linguistic minorities: 52nd report (July 2014 to June 2015)" (PDF). Commissioner for Linguistic Minorities, Ministry of Minority Affairs, Government of India. pp. 43–44. Archived from the original (PDF) on 15 November 2016. Retrieved 16 February 2016. ^ "Odia gets classical language status". The Hindu. 20 February 2014. Archived from the original on 21 February 2014. Retrieved 20 February 2014. ^ "Odia set to become classical language". Rediff.com. 20 February 2014. Archived from the original on 26 February 2014. Retrieved 20 February 2014. ^ "Cabinet nod for Odia as classical language". Yahoo News. 20 February 2014. Archived from the original on 5 March 2014. Retrieved 20 February 2014. ^ "Decks cleared for Odia to get classical status". The Odisha Sun Times. 20 February 2014. Archived from the original on 20 February 2014. Retrieved 20 February 2014. ^ Swetapadma, Mohapatra (August 2013). Recognition of Classical Status for Odia Language (PDF). Government of Odisha. pp. 92–93. ISSN 0970-8669. Archived (PDF) from the original on 25 February 2014. ^ Chethan Kumari (19 July 2016). "Manuscript mission: Tibetan beats all but three Indian languages". The Times of India. Archived from the original on 30 October 2017. Retrieved 19 April 2018. ^ Georg, Feuerstein (2002). The Yoga Tradition. Motilal Banarsidass. p. 600. ISBN 3-935001-06-1. ^ Clarke, Peter Bernard (2006). New Religions in Global Perspective. Routledge. p. 209. ISBN 0-7007-1185-6. ^ www.TheInfoIndia.com. "Odissi Classical Dance of India — Classical Odissi Dance India, Classical Odissi Dance Vacations India, Classical Odissi Dances Tour in India". Dancesofindia.co.in. Archived from the original on 18 May 2012. Retrieved 15 June 2012. ^ "Odissi Kala Kendra". Odissi.itgo.com. Archived from the original on 9 December 2010. Retrieved 15 June 2012. ^ Nishi Sinha. Tourism Perspective in Bihar. APH. p. 39. ^ Punam Kumari (1999). Social and cultural life of the Nepalese. Mohit Publications. ISBN 978-81-7445-092-0. Retrieved 16 August 2013. ^ Nishi Sinha. Tourism Perspective in Bihar. APH. p. 40. ^ Huke, Robert E. (2009). "West Bengal". Encyclopædia Britannica. Encyclopædia Britannica Online. Archived from the original on 25 October 2009. Retrieved 6 October 2009. ^ "Kolkata remains cultural capital of India: Amitabh Bachchan — Entertainment — DNA". Dnaindia.com. Archived from the original on 13 November 2012. Retrieved 15 June 2013. ^ "Odissi — A Distinct Style Of Indian Classical Music". Chandrakantha.com. Archived from the original on 5 August 2011. Retrieved 15 June 2012. ^ "Kolkata culture: Para". Department of Tourism, Government of West Bengal. Archived from the original on 21 December 2011. Retrieved 9 December 2011. ^ "Eden Gardens". ESPN CricInfo. Archived from the original on 8 July 2017. Retrieved 25 February 2012. ^ Frank, Sybille; Steets, Silke, eds. (2010). Stadium worlds: football, space and the built environment. Abingdon, UK: Routledge. p. 4. ISBN 0-415-54904-3. ^ "History of polo". Hurlingham Polo Association. Archived from the original on 18 August 2007. Retrieved 30 August 2007. ^ Das Sharma, Amitabha (7 April 2011). "Young turks rule the roost". Sportstar. Chennai: The Hindu. 34 (14). Archived from the original on 18 July 2011. Retrieved 27 February 2012. ^ "The automobile movement in India". The Horseless Age. Horseless Age Co. 14 (9): 202. July – December 1904. Retrieved 7 February 2012.